Among the latest dismal news about the strength of the US economy, on Tuesday ACT Research released preliminary truck orders for January 2019 which showed that Class 8 truck orders collapsed an astounding 68% for January. The decline is being attributed to a 300,000+ vehicle backlog potentially prompting fleets to halt purchases in the near term. 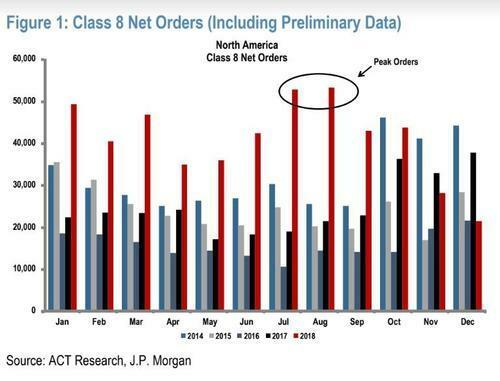 Specifically, in January Class 8 net orders were 15,800 units (14,700 SA; 176,400 SAAR), down 68% YoY and down 26% MoM. Class 5- 7 January net orders were 23,400 units, down 24% YoY but up 3% MoM. Class 8 trucks are one of the more common heavy trucks on the road, used for transport, logistics and occasionally (some dump trucks) for industrial purposes. Typical 18 wheelers on the road are generally all Class 8 vehicles, and traditionally are seen as an accurate coincident indicator of trade and logistics trends in the economy. Stephen Volkmann of Jefferies told Bloomberg that the collapse "should not be a surprise, but is likely to feed the bears". He also guessed that upgrade demand could continue to "support high production through 2020". We'll believe that when we see it. According to Neil Frohnapple at Buckingham, January is the third month in a row of year over year declines after Q3 of 2018 proved to be better than expectations. Frohnapple told Bloomberg he was "a little surprised" that net orders for January came in at just ~16,000. 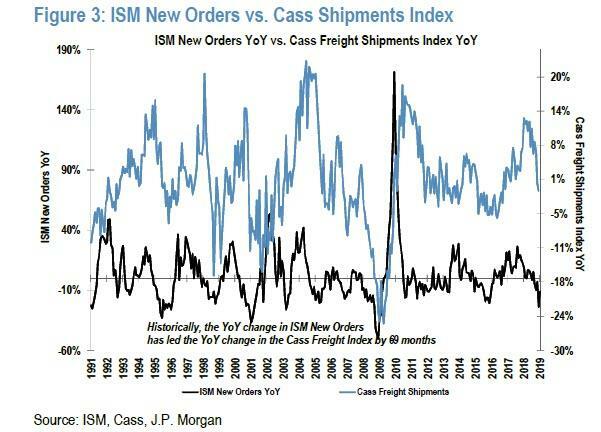 According to JPMorgan, the New Orders component of the ISM Manufacturing Index tends to be the best leading indicator of future freight trends and truck demand. Specifically, the year-over-year change in New Orders has historically led the year-over-year change in the Cass Freight Index (the bank's preferred broad-based indicator of freight trends) by 6-9 months. The ISM New Orders index was 58.2 in January, down 11.0% YoY but still well above 50. The Cass Freight Index was down 0.8% YoY in December (the latest month available). Despite this latest collapse in the trucking market, ACT Research commented: "Regarding Class 8, recall that January 2018 marked the point at which orders went vertical. We view this January’s order softness as having more to do with pulled-forward orders and a very large Class 8 backlog than with the current supply-demand balance. 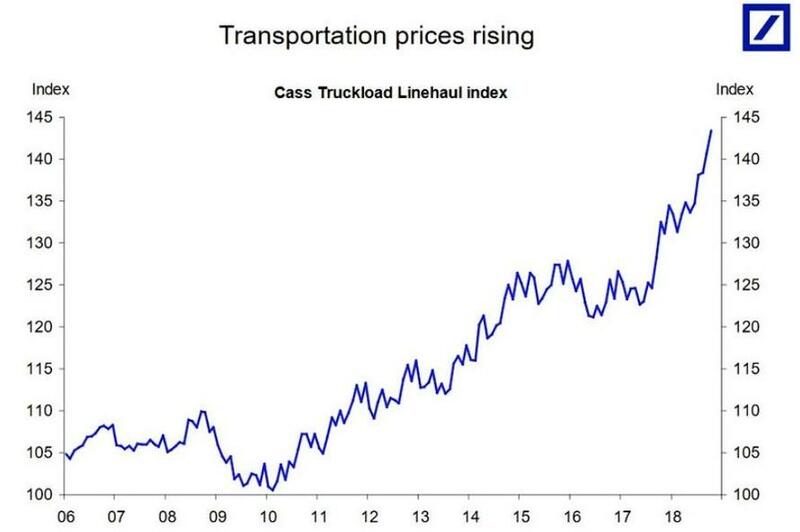 Softening freight growth and strong Class 8 capacity additions suggest that the supply-demand balance will become a story in 2019, but January seems a premature start to that tale." This news comes on the back of a terrible December for heavy truck orders, which we discussed about last month, when we noted that the exponential surge in transportation prices as a result of an acute scarcity of truck drivers sent trucking prices soaring last year, and led to a historic spike in Class 8 truck orders as supply had scrambled to keep up with demand. 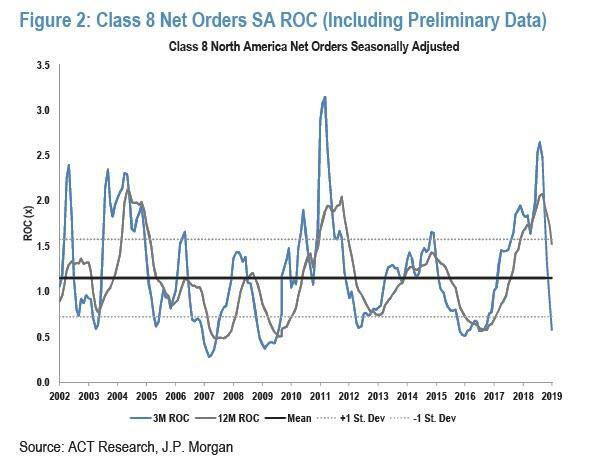 That was, until November, when Class 8 orders started their precipitous drop. Back in December, BMO analyst Joel Tiss said that while "there is no doubt that freight and freight-rate growth have slowed, we do not think that it is time to panic just yet" after December's sharp 43% plunge. With January's collapse now in the books, we ask "how about now?"